There are plenty of reasons for Twins fans to continue to tune in to games the rest of the season. Mitch Garver continues to look like he is coming into his own (even if Paul Molitor continues to bat him in the bottom half of the line-up). Miguel Sano is in “prove it” mode after being recalled from the minor leagues. So what other players can fans keep an eye on? There are a number of guys I'd love to see before year's end. But if we're talking about who is most deserving, I think the answer is Brent Rooker. Although he's only about 14 months removed from being drafted, the slugger has emphatically addressed some of his biggest perceived flaws — namely, plate discipline. Rooker's approach was a mess in the early going this year, evidenced by a 29% K-rate and 5% BB-rate in April/May, but he has gradually refined it, improving those rates to 25% and 13% respectively since the start of June. Meanwhile, he has posted some of the best numbers of anyone in the system. Despite his relatively recent arrival in the organization, Rooker turns 24 in the offseason so he's not especially young by prospect standards. He has handled every challenge thrown his way thus far. Because he's a right-handed power hitter who can play first base and the outfield corners, he's also a good fit for Minnesota's short-term needs. Why not give him a shot down the stretch and see how he responds? A strong debut would potentially put him in line to grab a roster spot out of spring training next year. There are a lot of different ways this question could be answered, and a lot of different names that could be thrown out there, but I'm going to go with urgency. The Twins need to take a look at the prospects they've already got on their 40-man roster. Even narrowing things down that way leaves you with no shortage of options, especially pitchers, but I'm going to go with Fernando Romero (even though he doesn’t qualify as a prospect any more). Romero looked pretty capable in the 11 starts the Twins have given him in the majors this season, and he's been very solid in his first crack at Triple A as well. He hasn't shown the dominating stuff he's flashed throughout parts of his career, recording 97 strikeouts in 125 1/3 innings, but he's still been effective, boasting a 3.59 ERA and 1.24 WHIP between the majors and minors this year. Speaking of that 125 1/3 innings, that marks a new career high already for Fernando. I was concerned about how he faded to end last year, but as long as there isn't a dip in velo or breakdown in his mechanics I'd like to see the Twins push him a bit farther this season. There are some other starting pitching prospects who deserve looks -- Zack Littell, Stephen Gonsalves and maybe even Lewis Thorpe -- but I think the guy most likely to stake his claim on a 2019 rotation spot is Romero. Might as well give him an opportunity to show whether or not he belongs. Stephen Gonsalves seems to be on quite the run in the minor leagues and it wouldn’t surprise me if he gets the opportunity to join the rotation in the coming weeks. He has been one of the strongest starting pitchers in the organization over the last handful of years and I feel like he has earned the opportunity to make his debut. For me, he is the answer to this week’s question. That being said, there are other names that will likely get some innings and at-bats before September ends. Rochester and Chattanooga don’t look like they will be qualifying for postseason play so players from those levels can be called-up for September. Recently acquired Tyler Austin could get some late season at-bats. Zack Littell could get a start or two. Some other relief pitchers also need the opportunity to show they can be part of next year’s pitching staff. Either way, there are plays to be watching over the next month and a half. Assuming Stephen Gonsalves is a given, because he absolutely should be, I think Brent Rooker has emerged as a serious candidate. Earlier in the year it looked like Nick Gordon had earned a shot to show what he could do in a brief stint, but that time has come and gone. Gordon is struggling mightily at Triple-A, and it would be a shock if he's the Opening Day option at 2B in 2019. Rooker has destroyed Double-A pitching, and has been deserving of a promotion for at least a month. If the Twins are willing to get aggressive, allowing him an opportunity for September at bats would be plenty fair. I still believe he should factor into the 1B/DH conversation for 2019, and allowing him to taste that level this season could be a nice boost. Stephen Gonsalves. He's earned the opportunity and finding innings in September should be easy. Gonsalves is the type of pitcher that should project for 200+ innings and allowing him to continue to pitch after the conclusion of the minor league season makes too much sense. Plus, like I mentioned earlier, he has earned it. It would almost have to be either Nick Gordon or Stephen Gonsalves, I think, and for me the pick would he Gonsalves. He’s simply had a better season than Gordon has. The problem could be finding a spot in the rotation for him. If Ervin Santana were to be traded, that could free a spot. While I suppose bringing him up for a look out of the bullpen would be possible, that wouldn’t seem to be either fair or reflective of his talent, given that he’s always been a starting pitcher. There are a plenty of guys I would love to see make at least some September call-up appearances, including the likes of LaMonte Wade, Nick Gordon, Nick Anderson, Jake Reed, and Kohl Stewart. I also think Brent Rooker has worked himself into that conversation with the tear he's been on at double-A. But I think the only clear answer here is Stephen Gonsalves. Quite frankly, he's been deserving of that for quite some time already. He's now in his sixth season with the organization, and has performed at every stop. He has 20 starts to his ledger in triple-A (plus two other appearances) and that has come with an 8-5 record, 3.57 ERA, .216 batting average against, and 103 K's in 111 total innings pitched. These are better numbers than the likes of the Zack Littell's, Aaron Sleger's, and Adalberto Mejia's that have gotten their opportunities before him. I've also thought the Twins have moved him in a notoriously slow fashion considering the numbers he has put up, so he should have already been in the majors by now in my opinion. Deserving is kind of a loaded word. I would love to see a lot of guys get a chance down the stretch. Stephen Gonsalves and Fernando Romero are both ready for an opportunity and deserving. While Brent Rooker's last two-and-a-half months have been terrific, the Twins have to make a decision on Tyler Austin this offseason, and maybe into spring training. LaMonte Wade has had a solid season. He is now injured, but he's deserving. But I'm going lump together a group of players, some are technically "prospects" and a few have surpassed the prospect status. But Alan Busenitz, Tyler Duffey and John Curtiss deserve the opportunity to pitch in the big leagues after they were strong the first three months of the year. They're all on the 40-man roster. Also, Nick Anderson and Jake Reed are quite deserving as well. Anderson was the best minor league reliever through the first two months of the season, and he had a solid July again. Reed struggled early, but he's been really good the last couple of months. And, Luke Bard has had ups and downs, but he can become a free agent at the end of the year, so I would like to see him get a shot with the Twins as well. How do you get six deserving guys to the big leagues? You can't, but they are all deserving. Hmm... that's some pretty good candidates for looks in the show. But I, like many of the writers/contributors, feel that Gonsalves has really worked himself to the point that he shouldn't be left out. He had a great spring and has, overall, had a good season in the minors. The FO is missing out, IMHO, if they pass him over again. Perhaps he fails miserably or is just Meh', but they really should find out. A close second for me would have to be Romero, he's shown already that he can be effective at the MLB already, bring him back. I'd love to see Gonsalves get a promotion and even if it's just a start or two. Let him get his feet wet. I'd assume Romero will be on an innings limit and I don't want to see him coming out of the bullpen with him having such a strong season and legit chance to start next season with the Twins. Would Rooker needed to be added to the 40 man / would that effect his number of options if he was called up in September? I'd like to see what Tyler Austin could do since he would be a good platoon with Mauer next season. Mauer faces only RH pitchers and Austin LH pitchers. If healthy I'd like to see what Pineda could do even if it's just out of the bullpen. ** Edit - I know Pineda isn't a prospect but it would be interesting to see him in September. MN has Austin whom I expect will get a call up. Rooker would give them the opportunity to see him at first and the OF, like Austin, and DH as well. Both of them could take Morrison/Mauer's spots in 2019. And why not? I know, Joe is MN and all that. But IF the Twins want to move forward, 2 RH sluggers to up the power ante would be helpful. Look at the Oakland lineup last night. Featured 6 or 7 guys with double figure HRs. That's how the game is played more and more. Knock it out of the park. Morrison had a blip season last year, Joe is Joe, and should just let it go. I'd love to see Rooker, he's been my guy since before they drafted him, but considering how many tough 40-man decisions the team is going to have this offseason I have a hard time seeing them adding anyone new to the roster that doesn't need to be there. If the team was going to dip down to AA, my money is on Lewis Thorpe getting some bullpen action in September, which would still be exciting. Though, the odds are likely still against it. Nice suggestion SF. I was just thinking that the other day, and the crown is pleased by your words . I don't think there are that many "tough" 40-man decisions. Yes, you have to add some players, but there is plenty to gain by subtraction. among those gone next year. Still hard to believe Thorpe is only 22. Like he skipped aging a couple years rehabbing the arm. Gonsalves turned 24 last month. 2 really good lefties upcoming. Romero will be 24 this winter, Berrios is 24, Mejia is only 25. He is getting more consistent, with the lowering of his pitch count. 5 starters right there, plus the others. I cannot see Erv returning. Would love to see Gonsalves and Rooker get a little bit of experience at the big league level. Gonsalves has been deserving of a chance for quite some time and Rooker really looks like the power hitter from the right side of the plate the Twins could use in the near future. I think Romero - barring a massive setback - should be a relative lock for the rotation or at least a very good look next year. Austin getting some regular big league time in a low pressure situation would be nice to see as well given the raw power and potential he offers. A couple others not mentioned I would love to see are Wade/Wiel. Both do a pretty solid job setting the table at the top of the lineup and though it's only AA you have to be encouraged by Zanders numbers, especially that average. Other than that, you guys nailed it. Great piece. It's easy enough for us to say the decisions are easy, but Morrison, Forsythe and Belisle are the only free agents, with Santana likely joining them. Everybody else is cheaply controlled beyond this year. None of the non-free agents listed above are guaranteed to be gone, and even so, you listed 7 guys, that doesn't leave much room for new internal additions and free agents, they're going to have to whittle it down past 7. Gonsalves should get the call.He has earned it.I don't know if he will get knocked around or not but now would be a good time to find out. Though he might be worthy I don't see the FO adding Rooker to the 40 man.They should, however, send him to AAA right away and if he does well there he could be called up early next season.I can see Zander is going to get aced out which is a bummer because he had a great season this year but if Rooker passes him there really is no place for him on the MLB club. Twins have some interesting 1B\OF position players at the higher levels right now. I wonder how that is going to shake out. I think this is pretty easy. On the pitching side, Gonsalves first, and then Thorpe. any 40 man reliever in AAA needs a look too. Have discussed this before, but the fact Rooker doesn't need to be added to the 40-man this year probably keeps him out of the discussion.Is he worthy of a look, probably.But by adding him to the 40-man means you aren't adding someone else.And that someone, say Jay, Stewart, Wade, Arraez, could very likely be gone. Considering they also have Austin probably joining the team, really no need to call-up Rooker to play the same positions. If Austin is out of options next spring he should be up now. Let LoMo go, who is more likely to be on the team next year? Interesting question. Pineda and Castro are going to take two of those spots -- there's no disabled list in the offseason. We'll estimate 9 internal additions. So then you're cutting chaff. Could start with pitchers that haven't been used much: Busenitz, Curtiss, De Jong, Drake, Duffey, Slegers. That's 6. Astudillo is probably gone. Wilson too. I'd guess Granite is cut, then one of Grossman or Field, and you have 10 spots cleared. For wiggle room, you've got the other of Grossman or Field, plus Magill. Not too tough. A little less wiggle room if they added Rooker, though. I think you missed one MUST ADD, Brusdar Graterol.So that takes it up to 10.Doubt they will be adding 10. I wouldn't add anyone to the 40 that doesn't need it.If Rooker continues to rake through August, send him to the AFL.If he destroys that, put him in AAA at the beginning of the year and then call him up after a few weeks, if he shows that he is the best bet going forward. I'd for sure get Romero back up, especially if Mejia is going to need any time on the DL. Come September, if Santana is still around, keep Berrios and Gibson on their regular pattern and then rotate Santana, Odorizzi, Romero and Mejia.Give Gonsalves that double header start at the end of September. If Santana can be moved after clearing waivers, then give Gonsalves his spot and let Littell pitch in the double-header. +Three Factors in 40-man Roster Decisions on who to call to the show. One: Status. On the 40-man roster or not. Worthwhile to add (if it looks like they will break the roster in 2019, why not). Two: Do ypu want to pay the guys (could be an extra $20,000 payday for anyone added in September) plus you have to house them on the road et al. Three: Who is REALLY deserving and will contribute, compared to just sitting on the bench and getting a taste of major league life. With a team in a sorta rebuild move, there is ABSOLUTELY NO REASON you can have 40 players on the team in September...especially if you STOP giving innngs to anyone that will not be here in 2019 (i.e. closer, first base, designated hitter, outfielder rotation, a couple of bullpen arms, an aging catcher). That's 7 bodies for sure, not counting cutting back on the actual duty of those people who have overpitched (Hildenberger) or don't need to play to cement their roster spot (some of the regulars, plus Grossman and Adrianza). Gonna get #1 out of the way right away. NICK GORDON. Not deserving as he has taken a nose dive. But you need to see just how bad he can play (or good). It goes a long way into making a decision on second base or shortstop in the coming season. If he looks overmatched and MAY NOT be the second coming at second, then you know. Stashing him in the minors and hoping he shines is not the game to play. Playing him is the game. Santana either has it in his next three starts or doesn't. Then, and people will complain, go with a six man rotation and let us see Goncalves and Romero up here. If Romero has limited innings, then also look at Littell. You also have Pineda coming back. If the purpose is to SEE arms, you go with the minor league rotation of late, letting a bullpen guy start a game, then short runs by starters. Thorpe doesn't have to be seen, although you are eating away at his 40-man time. The Twins have Duffey and Busenitz and Curtiss in the minors. You can see what the front office thinks of the duo...they would rather throw Drake, Belisle and are happy with Magill. So, you either let them come up and show their stuff (all three have been deserving in their minors work). You also need to make decisions on Baxendale, Reed, Bard and Anderson. A couple of them can walk at season's end. All look like they are capable of being on a major league staff. Why not see if they can be on a Twins staff. But still, that's 7 bullpen arms who could contribute and 3 rotation arms, plus you still want to give May work. Maybe entertain those offers for Rodney and Addison Reed with seriousness. Willians Astilludo? Extra catcher to keep on the 40-man (do we have to add Navarretto in the off-season). Possible bench bat. Can he DH? Who's on first. Joe Mauer is a free agent. You DON'T have to resign him. But who do you play. You got two guys, Tyler Austin and Brent Rooker. One out of options next year, the other an aging prospect that might be slightly overmatched jumping from AA to the majors. But...whynot. See what you have. Do you need to find a 1B guy in a rebuilding team? Are they capable of outperforming this year's DH? Will Miguel Sano stay at third? Ansd we still have three more guys on the 40-man to make decisions on their fate. Aaron Slegers. Long relief, a starter we want to give a 40-man spot to for another year? Chase De Jong...who is cut from the same cloth as Slegers. That extra starter, a possible multi-inning right-handed pitcher. Do you keep him on the 40-man. And then we have Zack Granite, a miserable season, but still probably playing as well as Byron Buxton who MAY NOT see the light come September himself. Is Granite just roster fluff. Taking up a space and never to be seen in Twins-town again like Adam Walker and Dan Palka? And Lamonte Wade...who is an off-season add as Cave and Grossman are not going anywheres. So six starters, adding in Goncalves, Romero and Littell with Santana disappearing. Bringing up Duffey, Busenitz, Curtiss and adding in Bard. ALso promoting DeJong and Slegers. Taking away innings from Reed, Rodney, Hildenberger, Rogers...in other words, give them a game a week and a September vacation. See if Willians can catch. Play Nick Gordon for 25-30 games and just SEE what he can do. Have Rooker and Austin rotate with Mauer at 1B and DH. Sadly say goodbye to Logan Morrison. Gorssman, Forsythe, Reed, Field, Wilson, Belisle, Drake, Magill...what ether names SHOULD NOT be in the plans for 2019? Think 2019 and beyond! Think WHO CAN break with the team out of spring training (I don't see Thorpe doing that, or needing to do that). Having watched a game in McCoy Stadium in Pawtucket makes me an expert on our AAA squad. So, hard pass on Gordon - he's floundering at AAA and would be overwhelmed against major leaguers. What's the value in that? 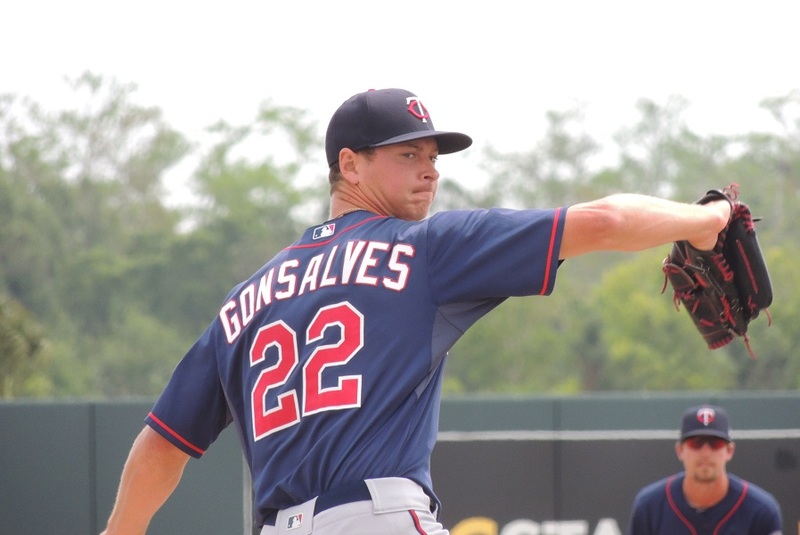 Conversely, as I've also said previously, bring Gonsalves up - he has mastered AAA and either will succeed or fail at the major league level with the rather eccentric pitch assortment he has, so this is one of the rare times I say "let's find out". He's the one I'd say "deserves" it, in terms of this thread starter. I didn't see enough of Austin to form a real opinion about his chances, but I would assume he will be given a look-see before the end of the season. But now I'm into the realm of guys already on the 40-man, which is a different and much easier decision for the FO. What about Odorizzi's spot on the roster? I know he's under control, but has been underwhelming almost all season. Can barely get 5 innings done. Part of me believes there is a disconnect. Lynn has pitched well for NYY. I wouldn't be surprised if Odorizzi did elsewhere too. Instead of jumping the gun with Rooker, anyone in favor of signing Hanley to a 1 year deal next year? And we can always flip him at the deadline if need be. wRC+ of 43 in AAA isn't bad enough for you? If you want an immune-compromised person to get better, would you inject them with cancerous lymphocytes? Except I guess for Tampa Bay, since he had worse peripherals last year than he does this year. If you want to look at facts and all that. I think you missed one MUST ADD, Brusdar Graterol. So that takes it up to 10. Doubt they will be adding 10. I think Graterol is like Alcala -- Roster Resource has them mistakenly eligible this winter. They both signed after the conclusion of their minor league seasons in 2014, and were 18 or younger on the preceding June 5. Thus, neither should be eligible until their 5th Rule 5 draft beginning in 2015, which would be 2019.